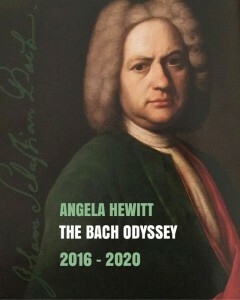 The Bach Odyssey has begun. Over the next four years, I will be presenting all the major keyboard works of J.S. Bach in a series of 12 recitals. The complete cycle will be given in London, New York, Ottawa, Italy, and Tokyo, with many other concerts along the way. The first programme (which includes the complete Inventions and Sinfonias, as well as the early Capriccios and the Aria Variata) had its first outing last Friday night in the Snape Proms at Aldeburgh. A wonderful place to start. People sitting on the floor in the “Proms” area listening to the most beautiful and concentrated music that exists. Tonight I’m at the Festival di Portogruaro, near Venice. After a Bach masterclass this weekend in Switzerland, I will be at Tivoli in Copenhagen on September 6th. For those of you who catch the entire journey, it will be a very worthwhile one. I’m thrilled to be doing it. We’ve posted a new page on this website dedicated to the Odyssey. See it here. More information to be added soon!